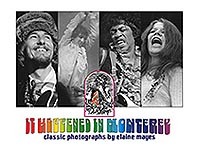 Since I was greatly impressed by the book, IT HAPPENED IN MONTEREY, I jumped at the chance to interview Elaine Mayes - the photographer behind the historic rock ‘n roll photographs of the 1967 Monterey Pop Festival. I had so much to ask her that I could have spent the whole evening asking just about Monterey Pop. So I tried to broaden my questions... “What was it like getting your start in photography during the ‘summer of love’?” “What was Monterey Pop like?” “Any advice for budding photographers just getting started today?” Although Elaine went on tour with the Steve Miller band to take photographs, Monterey was the only one of rocks BIG events that she photographed. She went on to teach photography and have an illustrious career in the photographic art medium. Since I have started to take photos for EAR CANDY, I couldn’t’ help to ask her about how things had changed in rock photography since the ‘60s. I’ve only shot a few events and my pictures have been less than fabulous – so I was really curious to how Elaine captured so eloquently the performers and the event. E.C. : First I wanted to ask you a few questions about your start in photography. Your book mentioned that you got your start in the San Francisco area. What made you decide to get into photography? Elaine: I was a student and I decided I wanted to be out in the world instead of in a room…that’s really the reason. E.C. : Talk about the right place in the right time, San Francisco in 1967. So I imagine that you got several photos of the ‘summer of love’? E.C. : Why did you wait so long to publish your photos from Monterey Pop as a collection? E.C. : I really like the mix of the performance shots with the audience shots. I also like your use of color, I think that really captures the psychedelic ‘60s, especially at Monterey. How did that idea come about? E.C. : In your book you also mentioned that it was hard to get back into the ‘pit’ once you left. How did you divide your time between the performances and the fairground shots? Elaine: Well, the wandering around was between shows. E.C. : How long did they have between the acts? Elaine: Well, lets see…I think the show started at 1 o’clock in the afternoon and it was over by 4. And then they didn’t start again until 7. Each day I had before and in-between to wander around. I went backstage during one of the shows, it must have been early on, but I decided there was no action back there. Everybody was outside, so I decided that that wasn’t the place to be. E.C. : When you were taking the audience photos, especially if there was a celebrity involved, did you get to talk to them any or was it just a case of taking the picture and searching for more shots? Elaine: Everybody was pretty much paying attention to the music, there wasn’t a lot of talking. Elaine: Yeah, I didn’t know who he was when I took that picture. I just thought he was ‘colorful’, so I took his picture. We kind of nodded and that was it. E.C. : Do you have any favorite memories of Monterey? When you hear a song by one of the performers on the radio do you recall certain events? Elaine: I recall the music and musicians a lot. You know, I don’t remember what I ate. I stayed at a hotel, but I don’t remember being in there. That’s the funny thing, that I don’t know. The memories would be the performances. Everybody was just overwhelmed by Jimi [Hendrix]. And I was really excited for Janis to be on because I knew her. Some of the San Francisco musicians I already knew before I got there. E.C. : How many shots did you normally take of each performer? Elaine: It would kind of depend on what I could see, which was really hard – you can’t tell that by the pictures. Maybe 5, 6, 10…it depends. It depends on my angle, everybody was in the pit and I couldn’t move. A lot of drummers got left out and people who were backstage got left out because I couldn’t see them. Only the people that were right at the front of the stage were really visible. E.C. : The book has many quotes by people who were at the festival, how did you decide which to put in the book? Elaine: I didn’t want somebody to write an essay about Monterey, I wanted original comments. Most of the people who responded were people that I knew. A lot of the quotations came from the symposium in Monterey, where some of the musicians I’d met before and some of them I hadn’t. I could go right up to them, talk to them and ask them if they would participate. There were some people that I wanted that never responded to me. E.C. : Where there many of your pictures from Monterey that didn’t make it into the book? Elaine: Not very many…there are like 144 pictures in there. And I exposed about 60 rolls of film. E.C. : Do you any plans for a publicity tour or an exhibit of the photos? Elaine: I’ve been doing a lot of promoting, book signings in California and New York. E.C. : After Monterey where there any other festivals that you photographed? Or were you teaching by then? Elaine: There were some little ones around in the Bay area. Then by the fall of ’68 I was teaching. I didn’t go to Woodstock. I didn’t go to Altamont. But ’67 and ’68 was kind of it for me in terms of documenting. I went out on tour with the Steve Miller Band all over the country…I did their first album cover. E.C. : Do you have plans to put any of your other photo collections together as a book? Elaine: Yeah, I’m trying to do a book on Hawaii. E.C. : Finally, what advice would you give to new photographers at rock shows? Elaine: Oh boy, it’s really different now. Then it was right open, you could just go anywhere. I don’t even know what to say, because photographers are even having trouble owning their pictures. Elaine: It’s very restricted, right? Elaine: My advice would be photograph what you are interested in and try to sell it if you don’t have an assignment. Elaine: I just watched for pictures when I thought the moment was right. I don’t know what to say about young photographers. Because it is about as much about business as about doing what you love. I never loved the business side, so I must have lived in the right era. That’s the big change now, because we owned our pictures. Now, there’s a whole thing going on where people are not owning their pictures. And I think that’s really bad.